Thank you for sharing your opinions on all of these different varieties of meat alternatives! We really appreciate your feedback. WOW, I really, truly love this stuff. It is the fastest non-dairy mac and cheese I can make and it pretty much rocks compared to non-dairy box versions. I notice you don't have any other cheese reviews, so I think this may be due to the fact that you are still capable of digesting dairy products. I envy you! Cheese was my favorite food hands down and for years I fought my body on its increasing lactose intolerance. My body won and now I wander the out lands, looking for anything remotely cheese-like that could replace my beloved food. As you may have gathered from you taste test of Amy's Mac and Soy, nothing, and I mean nothing, tastes as good as cheese... but for those of us who no longer have a choice, that mac and cheese ain't so bad. Gummy? Yes. Smell? Eh. Can it kill a cheese craving? Yes, if you close you eyes and savor that HS cafeteria mac and cheese flavor! I actually like this stuff and I will admit to being a mac and cheese snob. I hate Kraft dinner and would only eat the home made or fancy restaurant version. The only store bought mac and cheese I would consume is amy's. 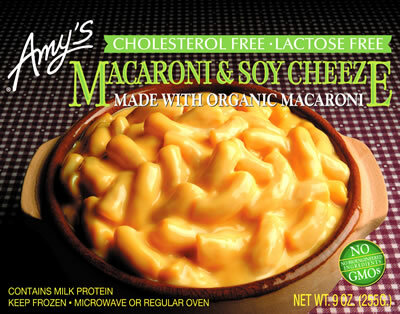 The amy's original mac and cheese is great and I liked to overcook it a bit to make is more crispy. I also like the soy version, but you really have to overcook it for it to taste good. 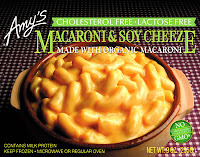 I don't really eat microwave mac and cheese anymore but I would recommend Amy's and the soy version is good for those that can't eat cheese or who want a version with less calories. Good to know! Amy's regular Macaroni and Cheese is delicious! It got all the delicious dairy in it, to make it super tasty! I will most def not be trying this gross soy cheese. I think soy cheese is pretty gross, regardless. Found this review online because I was doing a search for where I may be able to order this soy cheese macaroni of Amy's online. It's hard to find and our local grocery store always seems to run out. I can't say I eat it myself but I've tasted it and it's has a pretty good taste. I've never been a mac and cheese person though. We buy this because my 7 year old son LOVES it. He also will not eat meat so the fact that it's high in protein is very important to me. I actually like the smell, but yes it is not the usual cheesy smell that regular mac (with dairy) has. It has a unique taste and smell, which I don't find either displeasing. The fact that my son loves it makes us a huge fan of this product and it really is a go to meal for us. My advice is just try it out if you can't eat dairy or meat but do keep an open mind don't expect it to be your usual mac and cheese.